If you'd like to explore all of Belgrade's glory, stay with us and make your journey even greater. Our dream team will lead you through the best places in the city! We’re located in the heart of Savamala, the part of Belgrade pulsating with life. The location of the hostel is just perfect – the city center, best bars,pubs,restaurants, clubs ,free public parking, Sava river, Belgrade waterfront, cultural institutions and attractions and all of Belgrade’s well-known sights are very nearby and accessible on foot. According to similar notable establishments around the world, we have arranged our space in a minimalistic way: the bedrooms, the living room area, even the kitchen from which the smell of free coffee and jasmin tea spreads through the whole hostel! In spite of that, or perhaps because of that, the hostel is like a home for everyone who walks through our door looking for a piece of something for themselves. Whether you’re looking for company or you just want to have some peace – you’ll find what you need here. Appearance and comfort are not the only things because of which we stand out. The service is on par with any hotel-like service, while keeping everything cozy and affordable to our guests. We offer you modernly decorated rooms, fully equipped kitchen, lounge area with TV and smoking room. All rooms are spotlessly clean and neat. There are four deluxe private rooms with bathrooms, twin room with shared bathroom,triple or quadruple room with private bathroom and spacious dormitory room with ten beds. Beside every bed in shared rooms we’ve put up shelves (where you can lay a side mobile phones or locker keys). Under every shelf there’s a socket for your charger and a night lamp. The private rooms are accessible by a card with private bathroom and flat TV. We’ve also put up some quite unusual and interesting lighting, which has contributed to the soul of our special space. 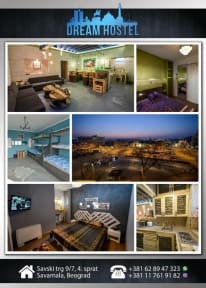 Throughout your stay with us you can have free coffee, tea, WiFi internet in all rooms, use of a computer, lap top, a locker with your own key, towels, blow dryer, maps of Belgrade, printing of boarding maps. We also offer these services: laundry cleaning, guarding your luggage or bicycles, making reservations in night clubs or restaurants, organizing transportation and accommodations in surrounding countries. With our positive energy and Dream team (as we call our kind staff) we are delighted to be your host and to make your stay memorable. Pas cher, propre, bien situé et très sécurisé. Je recommande même pour les longs séjours. 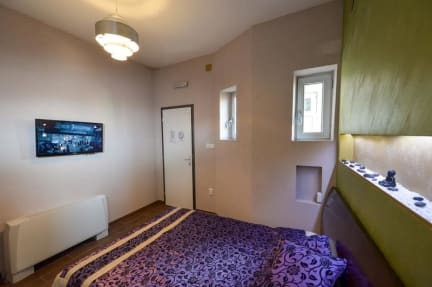 Nous avons bien aimé cet Hostel, très chaleureux. Nous avons testé les dortoirs et les chambres privées. Très bon rapport qualité prix. Cependant les draps sentent le moisi car ils sèchent en boule ... Casiers dans les dortoirs, niquel. Les sanitaires dans notre chambre privée étaient bouchés, tout était inondé après la douche ... Je recommande quand même largement cet Hostel.